Many of the architectural greats left their mark on Buffalo ; Wright, Sullivan, Richardson, Olmsted and beyond. Fancy yourself an architecture and design buff? There are few cities more abundant in architectural richness and significance than Buffalo. Once one of the country’s most bustling and prosperous industrial hubs, the Queen City’s twentieth century boom period drew the attention of not only of powerful business magnates, but some of the era’s most distinguished and venerated design talents. 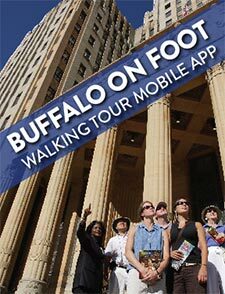 Today, you can still get up close and personal by touring Buffalo’s esteemed portfolio of structures on a wide variety of tours . But no architectural tour is complete without getting a bird’s eye view of the city from atop City Hall. From here you can map out your architectural itinerary. To the north you’ll step inside Frank Lloyd Wright’s opus, the Martin House Complex, the looming Richardson Olmsted Campus, now a stylish hotel, and Delaware Park, the crowned jewel of Olmsted’s sprawling park system. To the east, you’ll find the remarkable Central Terminal and revitalized Larkinville neighborhood. To the south, Silo City dazzles with creative reuse of massive grain elevators, now the setting for art installations and live performances. But Downtown Buffalo is where you’ll witness the largest collection of stunning architecture. From the Tiffany-adorned Shea’s Performing Arts Center to Louis Sullivan’s intricately adorned Guaranty Building, you’re in for an unexpected, jaw-dropping experience.